On the sides of buses round my way is an advertising campaign for www.notalwaysaande.co.uk. Why clog up the waiting room at Accident & Emergency when you could go elsewhere and mess up the system less? Perhaps to a Walk-in Centre, maybe your GP, possibly a pharmacy, or even stay at home and treat yourself. It's a fine idea for a campaign, given how many people wantonly head to A&E with a minor headache and then wonder why they have to queue so long. It's very sensible to point out the expertise standing behind the counter in your local chemist. And we should all know where our nearest Walk-In Centre is, because we never know when we might suddenly need it. But if you think to type www.notalwaysaande.co.uk into your browser, be that mobile or at home, how useful is the information provided? 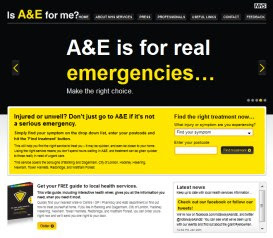 Across the top of the home page are big splashes announcing that A&E is for real emergencies only, subtly hinting that perhaps your malady isn't that important. Undeneath are a drop-down list and a postcode box where you can enter symptoms, from a restricted list, and your location. And in smaller print is the news that this is a website focused solely on the London boroughs of Barking and Dagenham, Hackney, Havering, Newham, Tower Hamlets, Redbridge, Waltham Forest and the City, so if you live elsewhere it's of no use. Oh, and there are no obvious lists. If you want to see a list of all the local A&E departments, bad luck. If you'd like a map of east London's Walk-In Centres, it's not there. If you're not sure where your nearest pharmacies are, you'd appear to be in the wrong place. Only by entering symptoms and location can you gain access to this hallowed information. The website assumes you're ill now, not that you might be sensibly planning ahead in case you're ill later. Unsurprisingly, if you have a grazed knee, hangover or sore throat you should treat yourself. If you have backache, ear pain or sore tummy you should see your GP, and you shouldn't need a map to tell you where they are. If you're blacking out or suffering blood loss or chest pain, then obviously you should go to A&E. A map and list of A&E locations is provided, at long last. But alongside is a blatantly cost-cutting suggestion that you should try to get to A&E by yourself if you can, with dialling 999 only as a last resort for those who "have collapsed or can't breathe". It's a bit of a drop-down lottery to find an illness deemed appropriate for visiting a Walk-In Centre. These it seems are only for cuts and scratches, itches, sprains, strains and suspected breaks, and nothing else. If your medical issue isn't on the shortlist (and nothing obscure but urgent is), then the website redirects you instead to NHS Choices where essentially you're asked to start again. A list of symptoms and destinations would be nice, all on one page for instant perusal, but no, that's only available by post. Instead the programmers behind www.notalwaysaande.co.uk have chosen to force you through a pre-determined funnel to tell you what you want, to prevent you from wrongly guessing what you need. And there are maps and lists of all the medical services in East London, but they're well hidden. You have to think to click on the dull-sounding "About NHS services" at the top of the page, then click on an arrow below to reveal some text, and then spot the "view all" link down at the bottom. And oh, that's unfortunate, the Walk-In Centres map reveals that there are no Walk-In Centres anywhere in Tower Hamlets. All this effort to direct us to the most appropriate service, and then that most appropriate service isn't there. The last time I wanted to use a Walk-In Centre I was sure there was one at the Royal London Hospital in Whitechapel, so I went there, only to discover it no longer existed. Signs directed me to alternative walk-in options elsewhere, but they were several miles away. At this point I gave up, but I'm sure most people would have wandered into A&E nextdoor instead, purely for convenience. According to the Royal London's website there are two Walk-In Centres in Tower Hamlets, one on the Isle of Dogs and one in Bromley-by-Bow. Alas www.notalwaysaande.co.uk completely ignores both, which means their online advice for Tower Hamlets residents is dangerously incomplete. A similarly-flawed service is offered by NHS 111. This is a special telephone number you're supposed to ring instead of 999 to leave the genuine emergency number unclogged. But before you add 111 to your phone, be aware that it only functions in certain limited geographical areas, such as County Durham, Luton, the Isle of Wight and Lancashire (excluding West Lancashire). In London it only connects to services in the boroughs of Croydon, Hammersmith and Fulham, Hillingdon, Kensington and Chelsea, and Westminster, so if you feel ill it's essential to consider geography before dialling. Sprain your leg on one side of Regent's Park and you can call 111, but I wonder how many people know which side that is. It's a sad truth that unthinking patients regularly make bad choices about where to take their symptoms, and the NHS frontline often suffers as a result. It's also true that when we're ill, we often don't have the best information about what to do at our fingertips. Alas it seems www.notalwaysaande.co.uk isn't the best way of changing things for the better.